Sing, Dance, Celebrate and SHOUT with new William Shatner Video Ecard from American Greetings! Preview Your Own Custom Card! What should William Shatner shout for you? The award-winning actor, director, producer, writer, recording artist and horseman can now add “greeting card personality” to his long list of impressive professional accomplishments with the launch of the newest American Greetings customizable ecard. 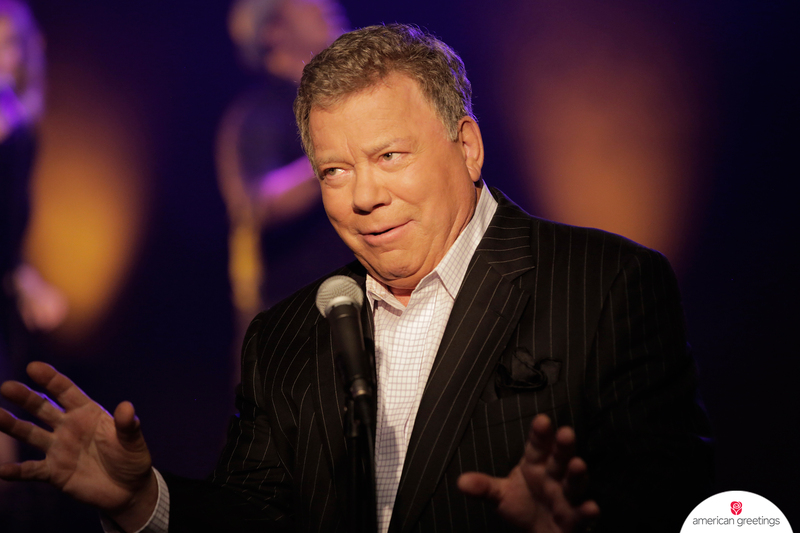 Set to the classic song “Shout,” William Shatner brings his incomparable and hilarious style of spoken-word singing – complete with backup singers and flashing lights – to this unforgettable way to connect with all your favorite people. Let Shatner SHOUT it out for you! What should William Shatner shout for you? After selecting the celebration-worthy occasion from the list of 32 options, consumers are able to personalize the ecard by choosing from over 1,100 names. Can’t find an exact match for your recipient’s name? Choose an endearment like Friend, Buddy or Honey. Consumers can find this William Shatner ecard and more digital options for staying connected at www.americangreetings.com. A great selection of inspiring cards from American Greetings is also available in the app stores for mobile devices, at participating drug chains, grocery stores and mass retailers nationwide, as well as in American Greetings and Carlton Cards retail stores. For more information on American Greetings, visit www.corporate.americangreetings.com. You can also follow American Greetings on Twitter, Facebook, American Greetings blog, YouTube, Pinterest, Google+ and Instagram. He won Emmys and his first Golden Globe for his portrayal of eccentric lawyer “Denny Crane” on both The Practice and Boston Legal. He received four more Emmy nominations, as well as other Golden Globe and SAG Award nods. Off the screen and broadcast waves, Shatner has authored nearly 30 best-sellers in both the fiction and non-fiction genres. His autobiography, Up Till Now, was a New York Times best-seller and was followed by Shatner Rules, which was released in October 2011. 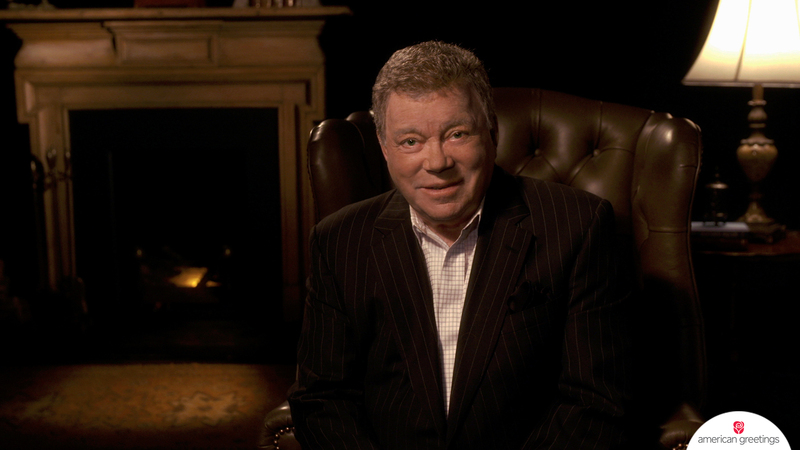 William Shatner’s new book, Hire Yourself, was released in May 2015. 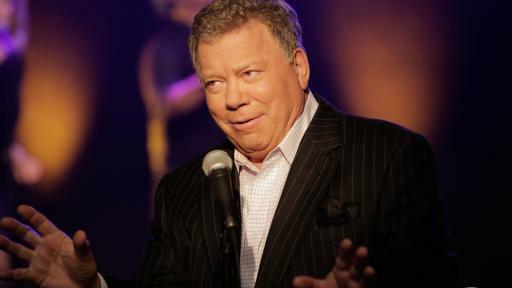 In April 2011, Shatner launched his one-man show, Shatner’s World that became a big hit on Broadway. Shatner continues to act, write, produce and direct, while still making time to work with charities and further his passion in equestrian sports. He and his wife, Elizabeth, and three married children live in Los Angeles.